The United Nations Global Compact and RICS issued a call to organisations in the land, construction and real estate sector, and those working with them, to take a leading role in global efforts to drive responsible and sustainable business practices. ‘Advancing Responsible Business Practices in Land, Construction, Real Estate Use and Investment’, was launched in New York today and examines the sector’s impact in relation to the UN Global Compact’s four focus areas of human rights, labour standards, the environment and anti-corruption. The resource identifies some of the most critical issues facing the sector, and breaks down the three key real estate life cycle phases, i.e. Development, Use, and Recovery, and proposes the corresponding actions to embed responsible business practices, illustrated by good practice case studies from around the world. The land, real estate and construction sector represents up to 70% of global wealth, contributes around one tenth of the total global gross domestic product (GDP) each year and represents 7% of overall employment. The sector also has a substantial impact on land development, resource use and waste generation. There are also issues related to human and labour rights during development and construction. Although many businesses in the sector have corporate sustainability strategies and policies in place, the challenge for many is to translate those policies into actions that are practical, achievable and repeatable, across organisational and geographic boundaries. 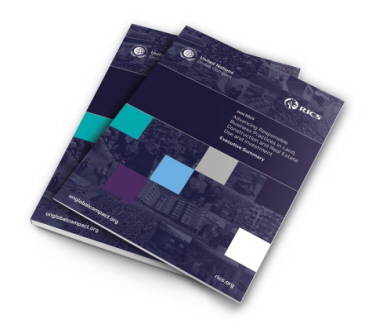 ‘Advancing Responsible Business Practices in Land, Construction, Real Estate Use and Investment’, aims to guide a broad cross-section of organisations with their decision-making throughout the real estate life cycle: from commissioning, planning, design and construction, through operation, refurbishment and ultimately disposal. The resource is the result of a two-year collaboration between the UN Global Compact and RICS, a global professional body representing more than 100 000 members in 146 countries. It’s a product of extensive dialogue with diverse stakeholders in the sector (see page 103 of the resource). This is one of the UN Global Compact’s first initiatives to promote responsible business that focuses exclusively on one specific economic sector. Hey Buddy!, I found this information for you: "RICS and United Nations Global Compact in new drive to advance responsible business". Here is the website link: https://www.duurzaam-ondernemen.nl/rics-and-united-nations-global-compact-in-new-drive-to-advance-responsible-business/. Thank you.